My friend finally got his fixed- gear bike today. He has been waiting for it to ship from practically the other side of the world for three weeks now. 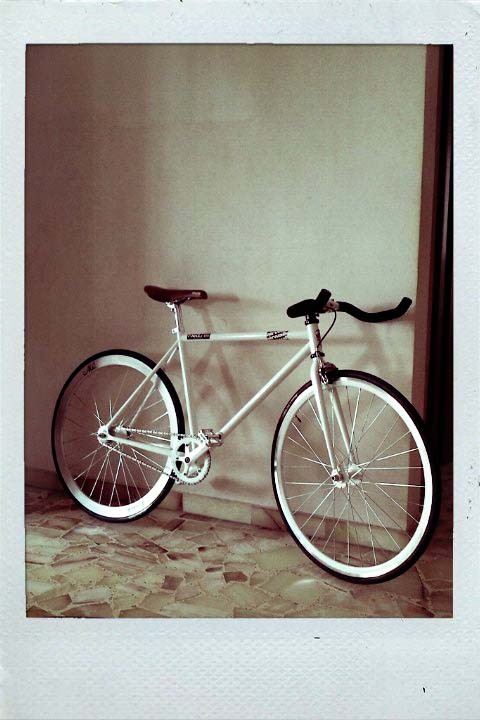 My friend's fixie and my flat's old school marble flooring made perfect sense together. I have seen the rapid explosion of fixed- gear bikes, fixies, all over magazines, coffee table books, blogs, the internet, tabloids (because the celebrities have been on them too), etc, for the past few years. Of course the true- blue hipster would be too quick to point out that he/she “liked it before it was cool, like the very early 90’s.” And whatever, shoot me for not finding out sooner. But here we are today, finding these bicycles all over town. These babies were actually no more than just regular messenger bikes, back in New York City in the early 1990’s. And like PBR beer- that blue collar workers’ drink turned hipster cool for being just that– the simplicity and irony of the fixie pretty much nominated it to universal coolness. 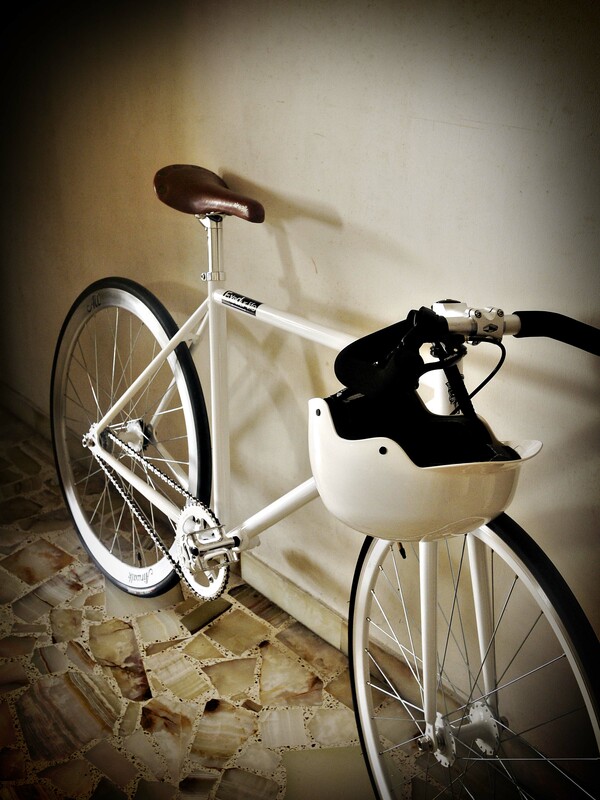 Basically just a single speed bike, its light-weight and slim body took the NYC bike messengers from point A to point B. No more, no less, right? Leather seat for the win. My white helmet, joining the fun. These days things are more exciting for the fixie than they were back in the day, I would think. As if to make the concept more original than it already is supposed to be *insert hipster high five here*, now you can literally make it your own– choosing from a variety of seats, handle bars, wheel rims, colors, paint, finish, pedals, accessories, etc etc. And while it was originally supposed to be dirt cheap (being stripped of everything a proper road or mountain bike is supposed to have), today it can easily set you back about a thousand grand. Not in pesos, sadly. 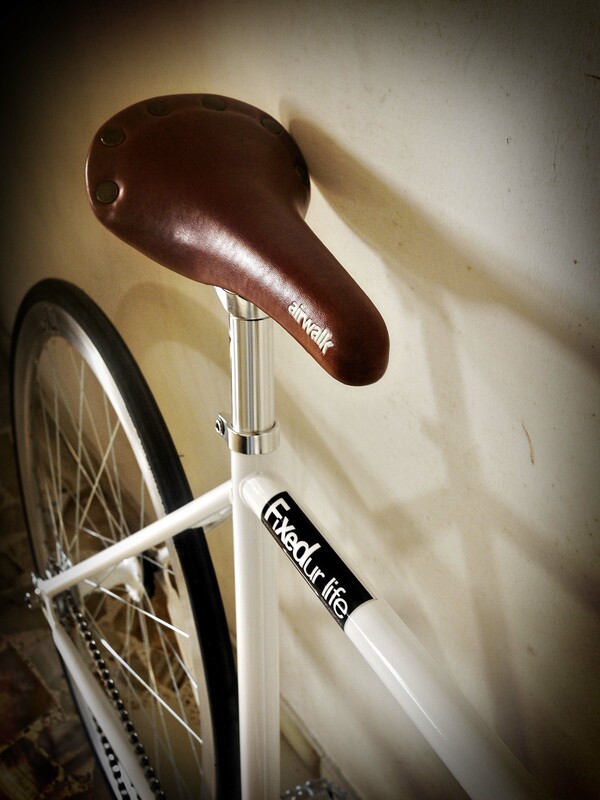 Should you get a fixie your self? If you are a cool fella/dudette who has no qualms of banging straight into stuff (or people) from time to time, and you have an extra $1000 in hand, and your neighbors are not of the kind to covet or steal… then, yeah. Why not! ya my friend’s bike is a looker. retro-ish too. 🙂 i haven’t been using my bike for quite some time now… must look into that myself, haha. FYI my other friend bought a RED- accented fixie too. i’ll try taking photos of that baby soon and show you! pero i have not seen any fixies here in manila.. either we’re still behind the trend, or i’m just not looking hard enough, haha.